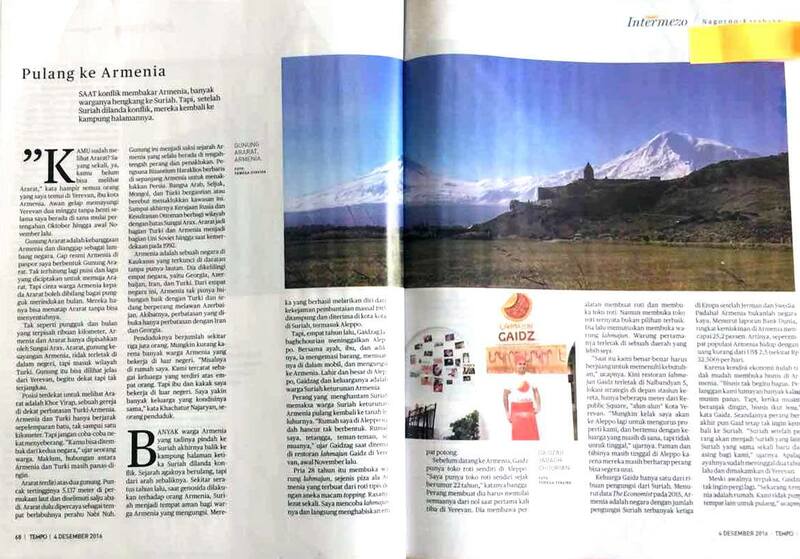 YEREVAN, JANUARY 10, ARMENPRESS. 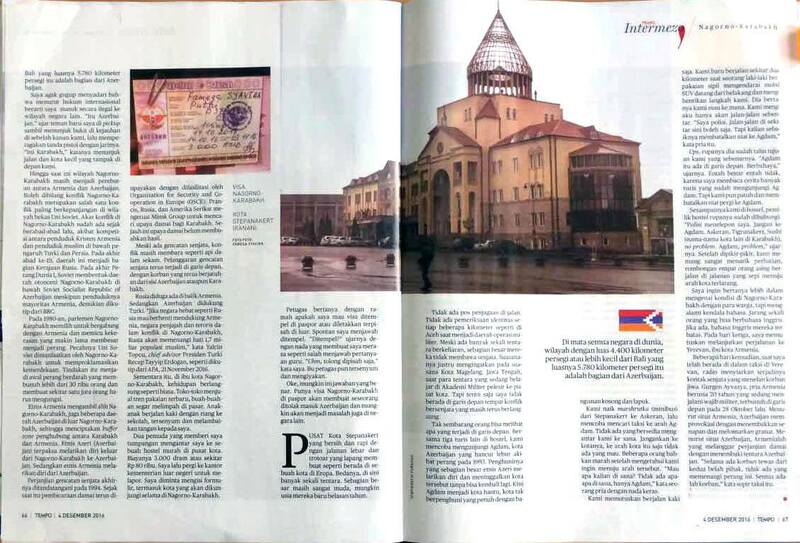 Journalist of Famous Indonesian “Tempo” monthly Famega Putri visited Armenia and Nagorno Karabakh in mid-October after which published an article about the visit. “Armenpress” presents the article with some contractions. “For centuries Nagorno Karabakh has been an apple of discord betwwn Armenian Christians and Muslims under the patronage of Turkey and Persia (Iran). Following the World War I the Soviet Union incorporated Nagorno Karabakh into Azerbaijan as an autonomous oblast, though Nagorno Karabakh was predominantly inhabited by Armenians. In late 1980s Nagorno-Karabakh Autonomous Oblast took a decision seeking reunification with Armenia, while a bit later Nagorno Karabakh declared independence. The war following these developments claimed lives of tens of thousands, while hundreds of thousands became refugees. Though a ceasefire has been signed, both Azerbaijan and Nagorno Karabakh suffer losses as a result of ceasefire regime violations. At the same time capital Stepanakert leads a normal life. The shops are abandoned with fashionable cloths and the city market with fresh fruits, while the lively children attending Stepanakert’s school greet me on the way. The clean and tidy center of Stepanakert reminds me of a European city, but in contrast to that European city the streets of Stepanakert are full of young servicemen. If in Indonesia’s Aceh checkpoints are stationed on each kilometer, there are no such checkpoints in Stepanakert. And though there are a lot of soldiers in the streets, majority of them have no weapons with them. A few days after my return from Stepanakert I learned in Yerevan about another ceasefire violation on the border, which had claimed lives. Armenian soldier Gurgen Ayvazyan was killed on the frontline on October 28. According to the reports the Azerbaijani side had taken provocative actions by using grenade launchers. As a taxi driver told me, there are no winners in a war as long as there are casualties from both sides. Everyone in Yerevan asked me “Haven’t you seen Ararat yet?, you have missed a great thing”. Ararat is the pride of Armenians. It is a national symbol. Today Mount Ararat is in the territory of Turkey. One of the places with a beautiful view on Ararat is Khor Virap – a monastery located very close to the Turkish border. Mount Ararat considered as the place where Noah's Ark landed, has been present in the history of Armenia and its people from ancient times and many songs and poems are devoted to it. When in the past catastrophes hit Armenia, many Armenians found shelter in Syria. Today, Syria is itself in a deep crisis, and Syrian-Armenians return to their fatherland. These are the Armenians whose grandparents could hardly escape the genocide committed by the Ottoman Empire against Armenians and found shelter in Syrian cities, including Aleppo. Kaytsak Chapaghjurian is one of those who repatriated, leaving Aleppo 4 years ago with his family; father, mother and sister. Prior to arriving in Armenia, aged 22, Kaytsak had established a bakery in Aleppo. Today Kaytsak runs his own lahmajoun fast food in Yerevan’s center, called “Lahmajoun Kayts”. “May be I will return to Aleppo some day to visit my relative still living there”, Kaytsak says. Kaytsak’s uncle and aunt still live in Aleppo hoping for a soon end of the war. Even if the war ends in Syria, Kaytsak no longer wants to return to Aleppo. His father died two years ago and is buried in Yerevan. “Armenia is our home, we don’t want to leave it”, he says. Kaytsak and his family members are one in thousands of Syrian Armenians who found shelter in Armenia. Though Armenia is not a rich country, it ranks second in Europe by the number of receiving Syrian refugees, staying behind Germany and Sweden”.